The fundamentals of probabilistic model checking for Markovian models and temporal properties have been studied extensively in the past 20 years. Research on methods for computing conditional probabilities for temporal properties under temporal conditions is, however, comparably rare. For computing conditional probabilities or expected values under ω-regular conditions in Markov chains, we introduce a new transformation of Markov chains that incorporates the effect of the condition into the model. 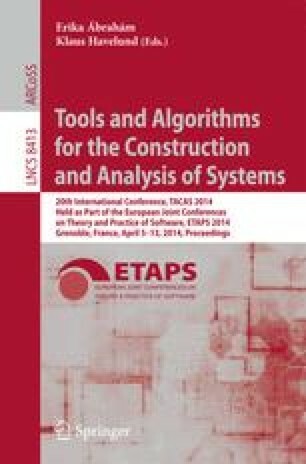 For Markov decision processes, we show that the task to compute maximal reachability probabilities under reachability conditions is solvable in polynomial time, while it was conjectured to be computationally hard. Using adaptions of known automata-based methods, our algorithm can be generalized for computing the maximal conditional probabilities for ω-regular events under ω-regular conditions. The feasibility of our algorithms is studied in two benchmark examples. This work was in part funded by the DFG through the CRC 912 HAEC, the cluster of excellence cfAED, the project QuaOS, the DFG/NWO-project ROCKS, and by the ESF young researcher group IMData 100098198, and the EU-FP-7 grant 295261 (MEALS).